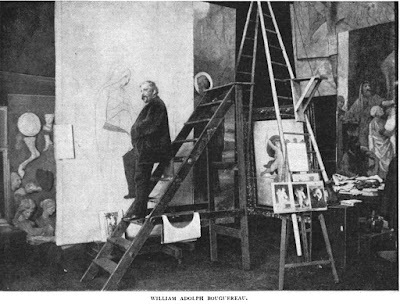 This photograph of William-Adolphe Bouguereau (French 1825-1905) in his studio shows the painter halfway up a ladder refining the line drawing for a large painting. Behind him on a wall are plaster casts of fragments of the human and animal figure. The casts give him reference to ideal form. On the small easel are small color studies or premiere pensée. 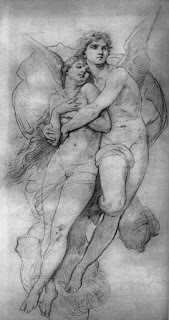 Bouguereau would typically develop a line drawing (often called a 'cartoon') on a separate piece of thin paper, then transfer that drawing onto his canvas, and ink it with India ink. 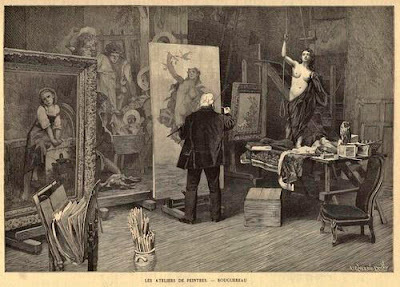 Engravings of Bouguereau in his studio were published for an enthusiastic readership in the same way that behind-the-scenes videos are used today to promote movies. 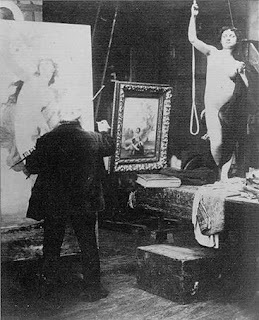 He brought a model into his studio to pose for Hemera, goddess of the day. She is lit by the same soft, indirect skylight that he has on his work. The model is able to maintain her upraised arm with the help of a dangling rope. This photo shows the same scene that we saw in the engraving. When you see the reality of the model, you realize how much Bouguereau was enhancing or 'plussing' what he saw to match his idealized vision of the world. Previous posts: plaster casts, premiere pensée.